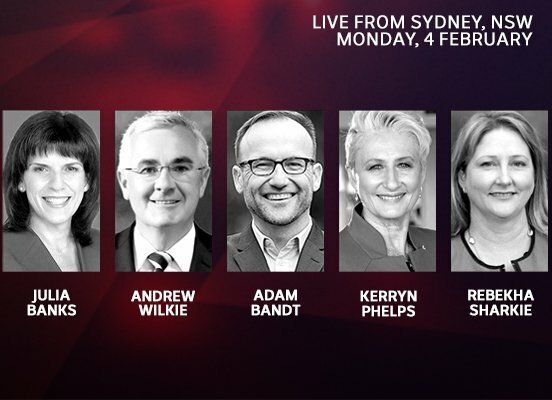 The ABC program Q&A broadcast on Monday February 4 2019, featured a panel of independent Federal members of Parliament. The Member for Melbourne and deputy leader of the Australian Greens Adam Bandt, not an independent, joined Tony Jones and other panellists for an hour of probing questions from convenor and audience. Love it or loath it Q&A alone justifies the ABC budget, but the makeup of this particular programme posited a future scenario which might change the topography of the national political landscape. The next Australian Parliament could see an Opposition bench comprising these independents, and a slew of others. Judging by the tone of the questions and the Twitter comments rolling across the bottom of my television screen, Australians appear likely to choose an independent over an incumbent sitting Liberal or National Party member. And it is crystal clear the Liberal Party of Australia is ignoring this threat to its existence. The well-funded campaign of high profile candidate Ms Zali Steggall OAM in the Federal seat of Waringah is a case in point. The possible return to the House of Representatives by former Federal member for Lyne in NSW Rob Oakeshott, revives memories of the Gillard minority government, supported by two of last Monday’s Q&A guests; the Greens’ Adam Bandt and Tasmanian MP Andrew Wilkie. It is unlikely either MP will join a minority Shorten Labor Government, but as key players in an Opposition made up of independents rather than members of the Liberal and National coalition, Wilkie, Bandt, Sharkey, Banks, Phelps et al, could sound the death knell of the loony, conservative Liberal rump. Furthermore strong independents could emerge from both the right and the left. Ructions within the Australian Greens might see former Greens candidate for the Melbourne seat of Batman Ms Alex Bhathal who quit the party citing ‘organisational bullying,’ recontest as a left independent. Similarly NSW MP Emma Husar who lost ALP endorsement for the Federal seat of Lindsay is ‘considering her options‘. On 7 December last year The Guardian reported an investigation by the ALP found, “Husar had mistreated her electorate staff but did not find evidence to support claims of sexual harassment or of her flashing another federal MP”. The circumstances surrounding Bhathal and Husar garnered substantial media coverage, but other lesser-known independent-minded political aspirants, such as Liberal blue-blood Oliver Yates, snagged media coverage when he announced he would contest Josh Frydenburg’s safe seat of Kooyong. Add these potential names plus Steggall to last week’s Q&A line-up, then count Cathy McGowan the independent MP for Indi and Bob Katter the independent MP for Kennedy in Queensland, plus others I might have omitted, and a formidable second tier Opposition bench emerges. But despite this obvious political threat, the Morrison Government acts as if it has the numbers in the lower House while denigrating perfectly reasonable legislation pertaining to refuges in off-shore detention, put forward by the Federal Member for Wentworth Dr Kerryn Phelps. When Prime Minister Scott Morrison scorns the Phelps initiative by saying it is, “selling out our border protection to get a cheap opportunistic win in the parliament,” he pushes thousands more electors toward independent candidates, and makes my thesis of an independent Opposition bench more likely. Add to this the PM’s backing of Liberal MP Tim Wilson over a sham franking credits inquiry just days after the fall-out from the findings of the banking Royal Commission, and it is safe to predict 20 to 30 Liberal/Coalition seats could fall at the next election. While this figure seems high, swings at state elections in Victoria, Western Australia and the Northern Territory, resulted in miniscule opposition benches. Like it or not, this is how the nation voted, and woe betide any political party which ignores the signs. Speaking of portents, millions of dead, stinking fish befouling the rivers of the Murray Darling Basin, means a cohort of National MPs also face the fate of their smug Liberal counterparts. The Federal Member for Maranoa in Queensland and Minister for Agriculture and Water Resources David Littleproud is I believe, vulnerable to an independent rural candidate who believes in science and climate change. Speaking of science, Littleproud said this on the ABC Radio AM programme recently. “This is politics, and when I became the Water Minister, I took the politics out. I didn’t call people names, like what happened in the past. It had to be a mature debate; it had to be predicated on science. The science was predicated, it was put in front of the Parliament, and these people should stop playing politics. They agreed to the science less than three months ago”. Uhm … I seem to remember our own Tony Windsor, Independent Member representing Australian voters in New England, had something to do with supporting the 2010 Gillard ALP government over the protestations of the Mad Monk. Then the MSM has reported that the very effective Cathy McGowan may retire at this next (2019) election …sadly if so. But all this is mere speculation, and there is still a lot of water to pass down the MDB plus too many dirty tricks, like Howard’s Children Overboard (NOT!!) and the meeting with bank executives BEFORE the underwhelming 2018 Hayne Royal Commission, to distract regional voters from the obvious regional disaster of water theft by broad acre farmers in SW Qld and NW NSW that has killed millions of fish and sent the Gladly Back-flip-I-can LNP misgovernment into extreme damage control and misinformation mode. An excellent policy would be to demand that all pumps operating in the MDB be fitted with satellite monitoring devices that give 24/7/365 monitoring of water pumping dates and volumes extracted, with severe punitive measures taken against the (allegedly few) rogue water thieves. This will require instant disclosure of political donations to be effective so that buying political immunity by donating to the National$ cannot occur. Why stop there and not go to the core? Remove the pumping equipment and monitor any renewed activity with heavy fines at the end. These people had been trusted to abide by the agreed “compromise”. They have shown to be NOT TRUSTWORTHY, as their greed apparently overrides all that. Now let them consume their ill-gotten stored water resources and – after that: NO MORE. The River system and the people living downriver will surely appreciate that. In the past the LNP have stated they are adults in relation to governing Australia. We viewed the adults on Monday night. This evening Keryn Phelps was involved with a pod caste in relation to climate change, a very powerful program. The LNP push security as a major issue; with energy we are very vulnerable. Foreign interests own a large proportion of the energy market, and virtually a monopoly has been developed. Judging by the level of coherence, intelligence and good manners exhibited by Monday’s Q&A panel ( and the audience), an Independent Opposition as outlined here, is fervently to be wished. Unfortunately, next week we are scheduled for the usual bunfight between competing political apparatchiks talking over each other, presented in order to demonstrate the ABC’s even handedness and Tony Jones’ lack of control. I am unlikely to watch beyond the first five minutes. “….. presented in order to demonstrate the ABC’s even handedness and Tony Jones’ lack of control….” was not written in jest? If so, it is contrary to my observations. “Even-handedness” is not a pejorative term: it is desirable and, in the case of the ABC, obligatory. I have not seen any evidence of Jones’ loss of control. Every guest is given a chance to comment on the question; he will allow a guest to have a rant before tidying it up with “we’ll take that as a comment, shall we?”; he will probe a guest who is obviously obfuscating or simply refusing to address the question; he is not averse to admonishing a vocal member of the audience. If ABC management honchos finally decide that Jones has to be replaced by Alan Jones or Bolt, “lack of control” will not be on their charge sheet. “evenhandedness” does not mean giving the same weight to unproven, science-denying opinion as is due to a raft of serious research and analysis. Facts, however, remain politically, financially and religiously very inconvenient. Excuse my ignorance but what does “her majesty’s opposition ” mean? Do all members of parliament swear to serve the Queen before the country? Liberals dressed as Independents are still Liberals. And they are targeting blue ribbon Liberal seats with a good chance of winning them – seats Labor was most unlikely to win anyway. Hopefully they will remove the opposition to action on climate change and they might even give Labor enough courage to help the asylum seekers we have incarcerated for so long and to stop Adani on legal grounds (water, threatened species, Native title….hell they might even consider climate change after a judge’s ruling earlier this week to knock back an approval in the Hunter on CC grounds). Labor is much more likely to be able to get through good policy with these independents than with the Liberal and National stalwarts they hope to replace. On the look-out for political corruption on a grand scale? Then look no further. … “ECG Advisory Solutions”, a lobbying firm founded by former Liberal party candidate David Gazard, has been advising Naval Group since last year on how to handle the difficult SPA negotiations with Australia. So what should we label this lack of disclosure? Perhaps an under-water matter? Or just a grand vol? That’s just the latest episode in that scandal MN. In March 2017, former defence minister David Johnston joined the board of Saab Technologies Australia. Then in October, Marise Payne announced Saab had been chosen to fit out Australia’s fleet of frigates with a new combat management system.which will be used on all of Australia’s future ship projects. No formal tender process was entered into. Two days later, Ms Payne made another announcement, with Saab winning a contract to update the control system of the ageing fleet of Collins Class submarines. Mr Johnston’s former chief of staff, Sean Costello, joined French submarine manufacturer DCNS, now known as Naval Group, in 2015 within months of leaving the defence minister’s office. In answer to your comment Kerry written on February on 9, 2019 Excuse my ignorance but what does “her majesty’s opposition ” mean? Do all members of parliament swear to serve the Queen before the country? Unless and until the nation declares an Australian as Head of State, then both the Federal Government and the Opposition swear allegiance to the English monarch via their pledge to her representative, the Governor General. Therefore the term Her Majesty’s Opposition while ironic in the context of my article, is accurate.